'No one makes alliances with the weak,' says Prime Minister shortly after meeting Putin. 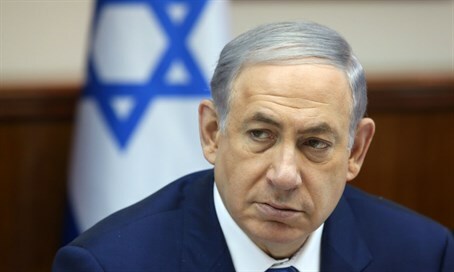 Prime Minister Binyamin Netanyahu offered a glimpse into his strategic aspirations Thursday at a Jewish New Year's reception at Mossad headquarters, which also marked 65 years since the intelligence arm's founding. Three days ago, Netanyahu met Russian President Vladimir Putin to discuss regional arrangements. Netanyahu said he was determined to stop arms deliveries to the Hezbollah terrorist group that has been aiding Assad forces, and accused Syria's army and Iran of trying to create a "second front" against Israel. Iran has deployed hundreds of additional soldiers from its Revolutionary Guards Force in an effort to prevent flagging pro-Assad forces crumbling in the face of concerted rebel offensives on their western heartlands. Putin for his part said Russia's actions in the Middle East "always were and will be very responsible," and downplayed the threat by Syrian forces to Israel. "We know and understand that the Syrian army and Syria in general is in such a state that it isn't up to opening a second front - it is trying to maintain its own statehood," he said in comments broadcast on Russian television.